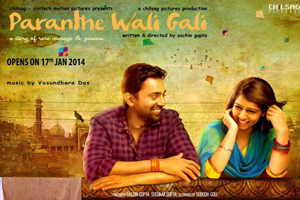 Paranthe Wali Gali is a 2014 Hindi romance comedy film directed by Sachin Gupta and produced by Sachin Gupta and Sushma Gupta and co-produced by Subodh Goel and Alka Goel. The film stars Anuj Saxena and Neha Pawar in the lead roles, while Mohinder Gujral, Vijayant Kohli, Himanshu Thakkar, Yuvraj Haral, Prabhakar Srinet, Jaspreet plays a supporting roles. Here is the link of all the songs lyrics and videos of Paranthe Wali Gali.